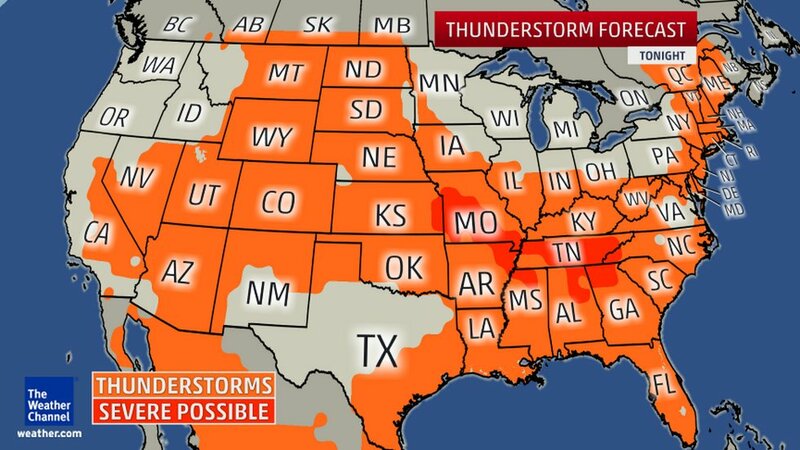 Orange areas indicate where thunderstorms are possible over the next 12 hours and red areas (if any) highlight areas where severe thunderstorms are possible. The TOR:CON index ranges from 0 to 10. Multiply the value by 10 to get your percentage chance of a tornado within 50 miles of a location. For example, a TOR:CON index of 6 means there's a 60% chance of a tornado within 50 miles of any location in the indicated area. For more on all severe thunderstorm threats, including damaging winds and large hail, check our severe weather forecast page. Note: By definition, a severe thunderstorm contains one or more of the following: hail at least 1 inch in diameter, wind gusts 58 mph or higher, or a tornado. Wednesday, July 1, 2015Scattered severe thunderstorms in southeast NE, east KS, west and south MO, northeast AR, southwest KY, TN, north GA, north AL, north MS. TOR:CON - 3 southeast NE, east KS, west and south MO, west TN, northeast AR; 2 rest of area. A chance of an isolated severe thunderstorm in east NY, northeast PA, VT, NH, MA, CT, west ME. TOR:CON - less than 2. A chance of an isolated severe thunderstorm in central and south AZ. TOR:CON - 1 or less. A chance of an isolated severe thunderstorm in central and east MT, east WY, east CO. TOR:CON - 2 or less. Thursday, July 2, 2015Scattered severe thunderstorms in south KS, TX panhandle, north and central OK, south MO, north and central AR, southwest KY, TN, north MS, north and central AL, north GA. TOR:CON - 2 to 3. A chance of an isolated severe thunderstorm in east NC, northeast SC. TOR:CON - less than 2. Friday, July 3, 2015Isolated to scattered severe thunderstorms in south-central and southeast VA, central and east NC, central and east SC.TOR:CON - 2 to 3. A chance of an isolated severe thunderstorm in southeast CO, TX panhandle and north TX, OK, AR, north LA, north MS, north AL, north GA, west SC, west NC. TOR:CON - less than 2. Saturday, July 4, 2015Isolated severe thunderstorms in ND, SD, west NE, extreme east CO. TOR:CON - 2 to 3. A chance of an isolated severe thunderstorm in west KS, OK, AR, TN, NC, east SC. TOR:CON - less than 2.